Soyuz TMA-20 was a manned spaceflight to the International Space Station (ISS) and was part of the Soyuz programme. It lifted off from the Baikonur Cosmodrome in Kazakhstan on December 15, 2010, and docked with the ISS two days later. 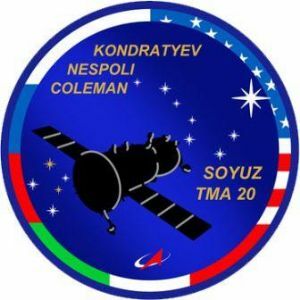 The three-person crew of Soyuz TMA-20 - Dmitri Kondratyev, Catherine Coleman and Paolo Nespoli - represented the partner organizations of Roscosmos, NASA and the European Space Agency (ESA) in the ISS program. Soyuz TMA-20's crew represented half of the members of Expedition 27; the other three members of the expedition arrived at the station on board Soyuz TMA-21 on 6 April 2011.